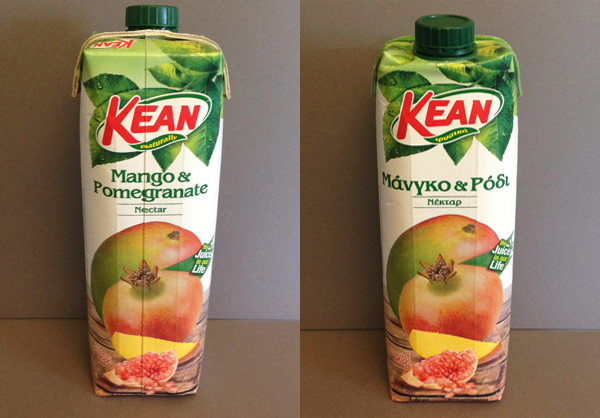 One of our team members recently returned from a vacation trip to Cyprus and brought back a carton of Kean fruit nectar (juice); she felt the package was worth sharing as an example for discussion. Kean products are manufactured in Cyprus and have worldwide distribution; however, their principle markets are the EU and Middle Eastern countries. Products range from juices, bottled water, tea and tomato products that are packaged in bottles, cans and aseptic paper packages, with an overall product line of 76 varieties sold in 48 countries. Kean has made an excellent effort in establishing a brand image and supporting it with a well-designed graphic system that quickly and easily facilitates communication wherever the product is sold. 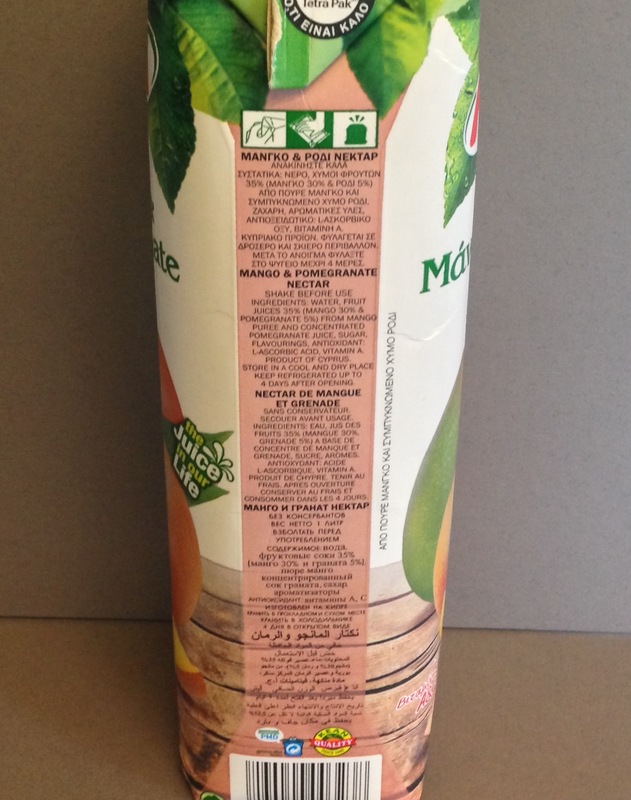 What makes this an issue is that European packaging, as compared to American packaging, must ascribe to strict rules regarding use, reuse and recycling of packaging materials, requiring the package structure and composition to be as concise as possible. Streamlining package shape and size to minimize its footprint is one thing but combined with the requirement to communicate content, use and nutrition, multiplied by the variety of languages, makes inclusion of that information difficult. The side panels are consumed with copy in seven separate languages, each with equal emphasis. The design system has been divided into two principal display panels, identical in every way except for one panel has English copy and the other has Greek copy. Removing the demand to rely on copy or language, the most important identifying attribute of the package is how the fruit is represented. The fruit graphic has maximum visual priority and consumes more than half of the available image area on each of these panels. Simply put, it is a design system a consumer doesn’t need to read to engage with – the picture says it all. There is so much about Kean packaging that teaches us what is important about packaging. The directness of the design connecting with the consumer is what I find most attractive. The package contains what is legally necessary, eliminates everything extraneous, and effectively relates to consumers regardless of age, language, education or culture. The design system is based on a strong visual that clearly identifies the product within their SKU mix. The aseptic composition of the package material insures that fresh, safe, and quality products reach our tables with minimum negative environmental impact. As in all cases with packaging, what ultimately matters is the quality of the product and the relationship that it forms with the consumer. As a consumer of Kean juices, I found your analysis of the company’s juice packaging very interesting; I have tended to reach for their products on the grocery store shelves, perhaps being subconsciously drawn to the attractive and easy-to-read labeling.